Electrotherapy is an electrical modality that is used in sports injuries by sports therapists and physiotherapists. 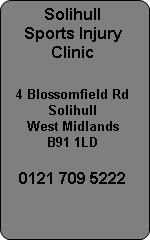 At Solihull Sports Injury Clinic we feel that after years of using ultrasound, interferential and mediwave that electrotherapy is very useful in treating soft tissue injuries. Most modern day physiotherapy students are put off using electrotherapy during their university training because they are taught " there is no clinical evidence to support that electrotherapy is effective in treating injuries"
Ultrasound is a very useful piece of equipment for treating ligament sprains and warming up scar tissue before treatment. It is non invasive and can produce quicker healing times on soft tissue injuries than rest and exercises. Interferential has many benefits including pain relief and increasing local blood supplies to stimulate soft tissue repair. Electrotherapy treatment in Solihull West Midlands for sports injuries and soft tissue injuries can speed up the healing time dramatically. If you use ultrasound, interferential or mediwave modalities you can return the injured athlete back into training faster. Many physiotherapist are taught that electrotherapy is not effective, this is not correct and years of experience shows us that you will delay your recovery if electrotherapy is not considered when treating a soft tissue injury.